LONDON, March 28, 2019 /PRNewswire/ -- Celebrating the start of National Pet Month, with its focus on the positive impact of pets on mental wellbeing, the Pet Food Manufacturers' Association (PFMA) releases its 2019 pet data, based on interviews with 8000 households[i]. The data confirms a stable pet population, which equates to 40% of households benefiting from pet ownership. Michael Bellingham, Chief Executive of PFMA and Trustee of National Pet Month, comments: "A recent government survey found 77 percent of people sometimes feel lonely and sadly those aged 16 to 34 were more affected than those aged over 50[iii]. Whatever your age, pets are good for you in so many ways; providing companionship, helping to reduce stress levels and instilling a sense of calm. Pets also give owners a reason to stay active and interact with others, giving a sense of purpose and boosting self-worth." Tanya Michelsen, Associate Director and Head of Brand Research at YouthSight, a youth agency that specialises in understanding Gen Z and Millennials explains: "Today, we are all looking for different ways to relieve stress and make our lives happier and more relaxing. In fact, 62% of 16-24 years olds tell us they regularly do as little as possible in their free time[iv]." Tanya concludes: "For Millennials, who are increasingly having children later in life, a pet is the perfect companion. They provide an everyday routine, non-judgemental company and give owners a reason to exercise and have fun. They provide stability in a fast paced, ever changing world." 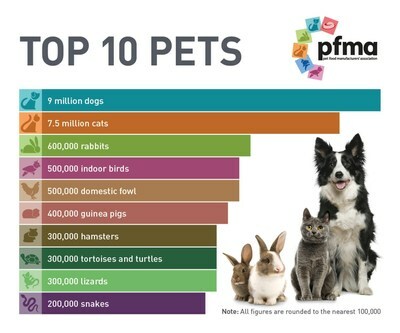 For more information on PFMA's Pet Population data, please visit pfma.org.uk or contact Nicole@pfma.org.uk or michael@pfma.org.uk. The State of the Youth Nation is the most up to date youth tracker in the UK. For more information please contact research@youthsight.com. [i] 8000 UK adults were interviewed by TNS / Solus Consulting in February 2019, in face-to-face interviews. [ii] Our data is split into categories 16-24 and 25-34 and in this survey we equate them to Gen Z and Millennials respectively.